Brazil is the largest country on the South American continent and is also one of its most popular with visitors from across the globe. You can experience all manner of activities its borders, from joining in with the largest carnival on Earth, the world famous Rio Carnival, to relaxing on the magnificent beaches; with over 4,500 miles of coastline, it is well equipped in that area. It has so much to offer that you’ll be in awe of its size and diversity, as it hosts an unforgettable array of different experiences which is made all the more special by a welcoming population, differing cultures as well as excellent food and Brazilian style. If you would like to know more about Travelbag’s excellent tailor-made getaways to Brazil, don’t hesitate to contact us on 0203 139 7074 and speak with one of our friendly and knowledgeable travel experts. The fifth largest country in the world by geographical area and by population, Brazil is the jewel in Latin America’s crown. The largest Portuguese-speaking country in the world and the only one in the Americas, Brazil is as unique as many of the wonders that are encased within its borders. A wonderful landscape epitomised by more than 4,500 miles of beautiful coastline resulting in the legendary golden sands of Copacabana Beach in Rio de Janeiro with Sugar Loaf Mountain and Christ the Redeemer as the iconic backdrops to the vibrant and colourful coastal cities of Salvador and Sao Paulo. With over two-thirds of the country covered in the ever-enthralling Amazon Rainforest there is the perfect opportunity to let out your inner explorer. The natural wonders that await you in this part of the world are incredible and beyond words and the only to know what it is truly like is to discover this fascinating, colourful and amazingly cultural country for yourself. The samba nation is well known for its fanatical sports experiences, hosting the 2014 FIFA World Cup, and the 2016 Summer Olympics in Rio de Janeiro. There has never been a better time to experience what this wonderful country has to offer. Enthralling views across Brazil’s largest city of Rio de Janeiro from Sugar Loaf Mountain. 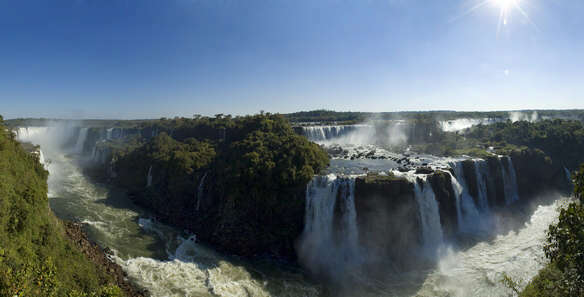 Natural wonders such as Iguassu Falls and the Amazon River provide you with a sense of excitement and discovery. Discovering and exploring the incredible Amazon Rainforest. Wonderfully beautiful coastline that is just perfect for you to relax and admire as the Atlantic Ocean ripples on the shore.